SPECIAL OFFER - WIN A DOUBLE PASS TO THE EVENT - just like and share our Facebook post (Te Puru Community Centre) and be in the draw to win the double pass - it will save you $260! 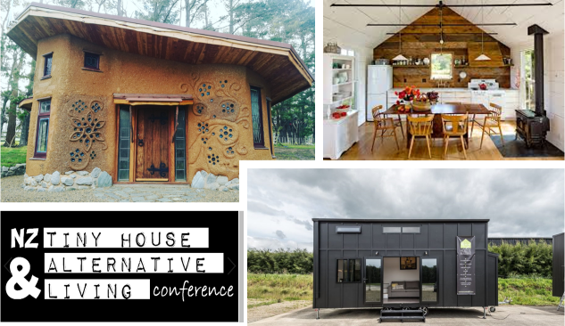 Celebrating its 3rd year, the NZ Tiny House & Alternative Living Conference is back on April 27th and ready to take it to the next level! Te Puru Community Centre will come alive when we return with even more speakers covering tiny house builds, tiny house design, off-grid solar set-ups and what you need to know, living life in a house bus, sharing the realities of living life on the road, minimalism, yurt life, and sustainable living. Join us - we will have Tiny houses on display, 15 guest speakers talking about everything from DIY builds, to commercial builds, tips when leasing land to protect yourself, to legislative and planning rule changes that are needed to enable tiny house communities to flourish in New Zealand. We also have an amazing line-up of Kiwi businesses displaying off-grid solar, tiny house trailers, steel framing fabricators, plus much, much more! The conference runs from 9am - 5.30pm then attendees can book to join the speakers and organisers at a local restaurant. If you would like to attend the dinner please email info@tinyhouseconference.nz to book your spot. Spaces are very limited so it will be a case of first to book in can come! Another sell out is definitely on the cards. Limited pre-sale tickets are available until sold out, don't wait too long because they won't last. Click HERE to buy now.